The future of the printed book lies in its becoming a beautiful object. We’ve heard this so often in the past few years that it is now a slightly wearisome cliché. It may well happen that fabulous design and production values will prove to be the book’s salvation, at least for a time. But could the medium’s future viability also partly lie in an expanded idea of what a widely available printed book might aspire to be? Redheaded Peckerwood by Christian Patterson, an artist and photographer based in Brooklyn, is a compelling example of this kind of open-ended book project. The volume, published by MACK, was widely noticed and made it on to the “best photobooks of 2011” lists of Time, the New York Times, and many other publications. It helps that its subject matter—the killing spree of 19-year-old Charles Starkweather accompanied by Caril Ann Fugate, his 14-year-old girlfriend—is an episode of enduring fascination in the annals of shocking American crime. Patterson came to the subject, as many do, through Terrence Malick’s film Badlands (1973), a fictionalized version of the events that took place in Nebraska in January 1958. He researched the crimes and took to the road, following Starkweather and Fugate’s path and accumulating pictures as he went, some forensic in style, others more reflective and poetic. His book, which he also designed, has been likened to a dossier of evidence for the reader to decipher and it certainly demands large interpretative and associative leaps. Patterson takes wonderfully lucid photographs of mysterious objects, blemished walls and forlorn landscapes and mixes them with reproductions of documents (including the killers’ handwritten confession) and old archival images. The artist makes no editorial comment, but includes a loose booklet with essays by cultural critic Luc Sante and photography curator Karen Irvine to provide some context. The fragmentary nature of the narrative, if that’s the right word for the image sequence, poses a challenge. Even in his choice of title, Patterson assumes prior knowledge of the subject—Starkweather had red hair and only Americans will get the pejorative meaning of “peckerwood.” The ideal reader would already know the story of the 11 murders in some detail, the better to grasp where Patterson blurs the lines between fiction and nonfiction by introducing images with mythical or atmospheric meaning rather than a basis in known fact. Sante says that investigators had somehow overlooked the stuffed toy dog that Starkweather tried to buy from his first victim, and that Patterson found it—50 years later—at one of the murder sites. It sounds unlikely, but without Sante’s mention there is no way we would know quite what Patterson’s curious picture, placed next to a placard saying “Fruit cake 98¢,” is supposed to represent, however charged it might be with tarnished innocence. Irvine suggests that Redheaded Peckerwood “contests the possibility of a fixed interpretation of the events.” I doubt many readers imagine that such a phantom exists in this case or any other. 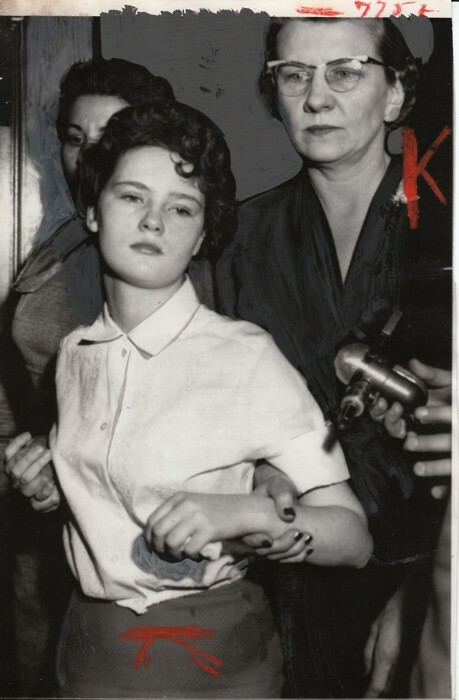 We can speculate for ever about the inadequacies or hopelessness that transformed Starkweather, executed in 1959, into a teenage killer. Sante’s suggestion of “subliminal connections” between the images and the gradual emergence of meaning sounds closer to how the book’s flow of pictures works. The longer you contemplate it, the more it acts like emotional music. The news photo found near the end of Fugate after sentencing, a diminutive but defiant teenager, much like any other, is an invitation to return to the start and begin your investigation anew. Note: All above pages taken from Redheaded Peckerwood. Pages photographed by Gareth Hacker, courtesy of MACK.